Plant Growth Promoting Rhizobacteria (PGPR) Enhanced Phytoremediation Systems (PEPS) have been successfully developed through a collaboration between Waterloo Environmental Biotechnology, Earthmaster Environmental Strategies and the University of Waterloo. By Waterloo Environmental Biotechnology Inc. based in Hamilton, ONTARIO (CANADA). By ArrayGen Technologies based in pune, INDIA. By Indoor Biotechnologies, Inc. based in Charlottesville, VIRGINIA (USA). By ZÜBLIN Umwelttechnik GMBH based in Stuttgart, GERMANY. By M/s Green Solutions (India) Pvt Limited based in Coimbatore, INDIA. By The Energy and Resources Institute (TERI) based in New Delhi, INDIA. With facilities in Europe, the United States and Asia we are an internationally leading provider of DNA sequencing services, genotyping services, DNA synthesis products and bioinformatics services for pharma, diagnostics, food, agriculture, biotechnological and research markets. By Eurofins Air Toxics Inc based in Folsom, CALIFORNIA (USA). By ENEA-Italian National Agency for New Technology, Energy and Sustainable Economic Development based in Rome, ITALY. By ChemCentre based in Bentley, AUSTRALIA. By IDRECO S.p.A based in Voghera, ITALY. 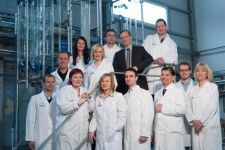 Schwarting Biosystem GmbH has a state-of-the-art chemical-analytical and microbiological laboratory on their own premises. This is where our qualified personnel carry out analyses specifically tailored to the requirements of biogas plants. By Schwarting-Biosystem GmbH based in Flensburg, GERMANY.